The alternator keeps your battery fully charged, to provide electrical power to the car. The source of that electricity is your car’s battery. But all those additional electrical systems place an enormous load on the battery. That’s where your car’s alternator comes in. The alternator is a special type of generator designed to keep your car’s battery charged and the electrical system in tiptop shape. As important as your car’s alternator is, your only way of monitoring its operation and health is often through a little light on the dash. If the light comes on while the engine’s running, you know something’s wrong. You just don’t know what. It could be an alternator problem… then again it could just be a broken fan belt. But that’s okay, because the technicians at Cottman are specifically trained and experienced with your car’s electrical systems… including the alternator. They have the tools and equipment to test your car’s electrical system and pinpoint the precise problem that’s causing your car’s electrical trouble. 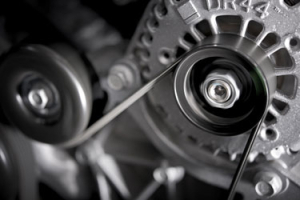 And, if you do need an alternator, they can replace yours with a high quality one and get you back on the road… fast! Of course, an electrical problem doesn’t have to be caused by the alternator itself… even if the alternator isn’t charging properly. A worn or broken fan belt, a loose or damaged wire, even a blown fuse can cause a problem that could appear to be a bad alternator. That’s okay, because your friends at Cottman are familiar with those different electrical systems, and they know how to identify exactly what’s wrong with your car. So, when you bring your car to Cottman, you can be sure you’ll never pay for an alternator unless you really need an alternator. If you think your car has an alternator problem — or any type of electrical problem — find your local Cottman and set up an appointment to have your car’s electrical system checked and diagnosed. Do it today!